This is the story of the Princess and the Sweet Tooth. Once upon a time [yesterday at 4:52 pm], a lovely princess [an unshowered, couch-lazing chocoholic] desired a royal sweet [Wills was with Kate, and the younger red-headed brother is too wild—even for a cougar princess]. But when the princess rang her bell, no one came calling with a tray of Godiva Chocolates [or something organic and fair trade-ish]. So she got off her throne [it folds out into a bed] and searched for something rich and dark [but George Clooney wasn’t in the pantry]. Upon discovering some royal subjects [dried apricots, chocolate chips and pistachios], the princess quickly fashioned them into royal jewels and barely lifted a finger [except to take some mediocre photos, photoshop them, write a scintillating parable, rewrite it because the first draft did not scintillate, format it into an archaic blogging platform, and hit “Publish”]. 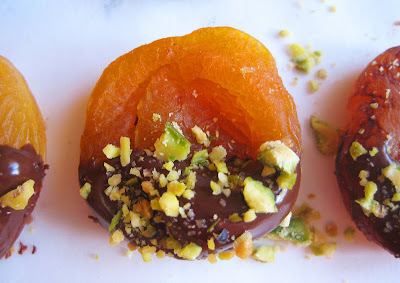 These were even easier to make than her chocolate-covered mint leaves that required a more delicate chocolateering method. The princess was so pleased with her creation that she pilfered all the jewels [ate 24 apricots, but who’s counting?]. It was so simple, if the royal subjects had been sitting on her 16th-century, gem-encrusted credenza [IKEA coffee table], she could have fashioned these royal jewels from a semi-reclining position without ever having left her throne. The moral of the story? If a princess is as clever as she is lazy, she will be compensated with the consummate confection. 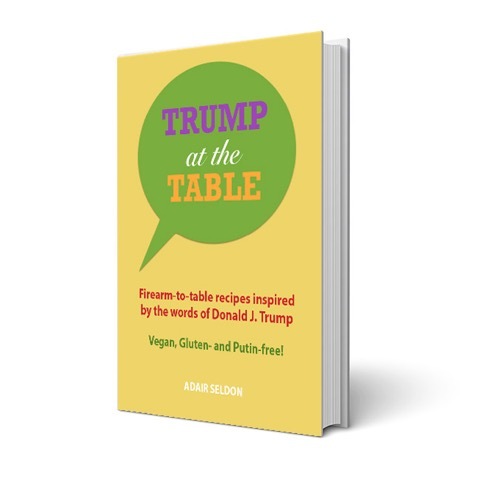 Melt the chips in a double boiler or in a small bowl in the microwave on medium power in 30-second intervals until melted. 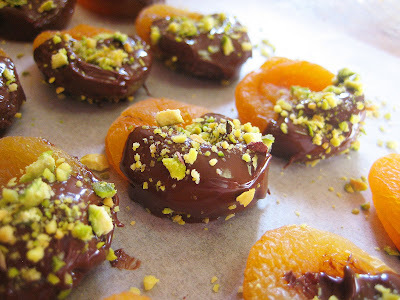 Dip half of an apricot into the chocolate, and sprinkle the nuts on both sides while you’re still holding it. 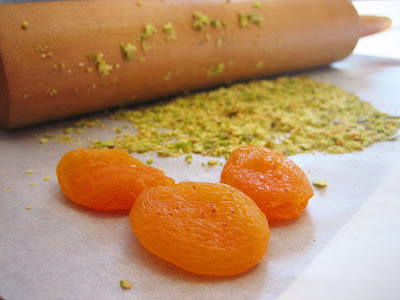 Then lay the nut-encrusted apricot on a sheet of wax or parchment paper to set. Will last a few days unrefrigerated in a covered container. I predict I am going to hate you for this. 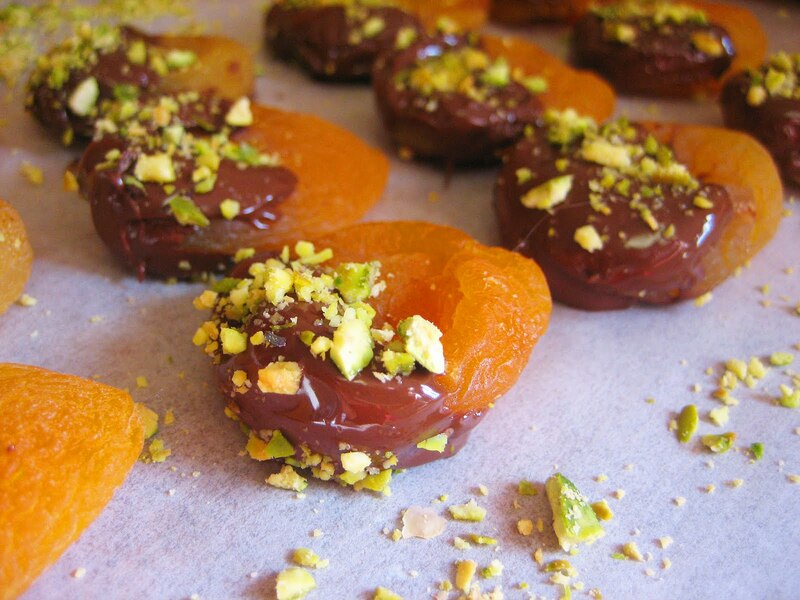 Simply stupendous, scintillating, and sophisticated sweets!!! Your confections look gorge and that's exactly what I'm going to do as soon as I make them. Princess, your photos are fabulous and show the perfecton of your creation. Bravo! Have a great holiday weekend! Hi, I found your blog through Bibberche. What a fun story and how I wish I too had someone rich and dark lurking in my pantry. What a great idea for a (sort of) healthy snack. I love these, even the colours are gorgeous. Lana: Thanks for the nomination! Hotly Spiced: Thanks for stopping by! haha! I really enjoyed your fairy tale!!! this was so fun to read and what pretty pictures!!!! looks yummy! I love everything [mostly the George Clooney part] about this post [thing you agonized over while downing chocolate covered apricots]. I will definitely [about a 30% chance because who am I kidding] be making these soon. Simple and scrumptious - so glad I took a 1/2 dozen!